I’m totally in denial about how much I have to do this week and in the process I’ve realize that my coping mechanism is kinda messed up. In my head I keep thinking- It’s just food. It’s no big deal. I’ve got this. I mean…this is the kinda stuff I love. Then suddenly a part of my brain is trying to figure out how I am going to fit all the stuff in the oven and the cooking times of everything. Oh! And I’m also processing the fact that I am making my first turkey and that I’m spatchcocking it. And where am I going to find time to clean my toilets & get the sunflowers I want for my table arrangement. My stairs need to be vacuumed too! Suddenly, I’m eating a bite of hobo bread from Trader Joe’s (yeah, that’s a thing) and my to-do list just disappeared. 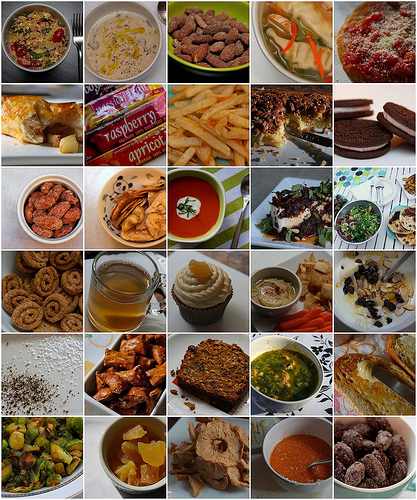 Food as a coping mechanism? Noted. Some of you might be in the same boat as me right now and some of you may just have dessert duty or side dish patrol (lucky you!). 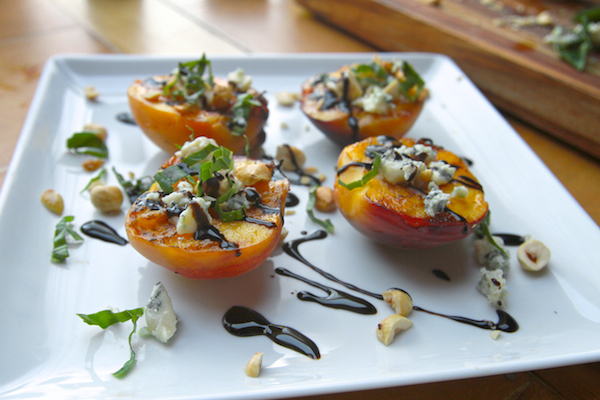 If you’ve got crazy hosting brain, you may have forgotten that there needs to be nuts at your appetizer spread. That’s cool. I’ve got something that’s so easy and brainless (we need our brains when we’re getting a whole Thanksgiving together!). 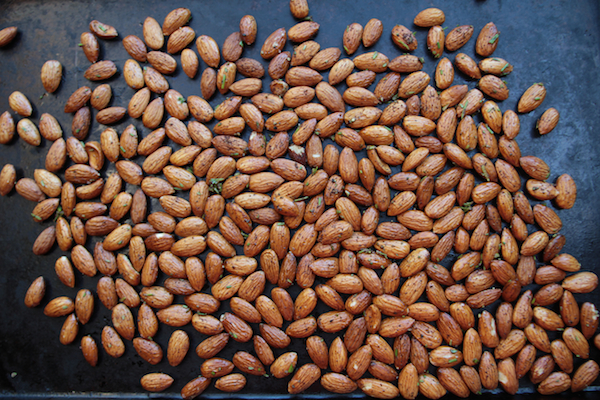 What I like about this recipe for Roasted Rosemary Almonds is that it’s a really simple thing to cross off my to-do list. They’re super tasty too. 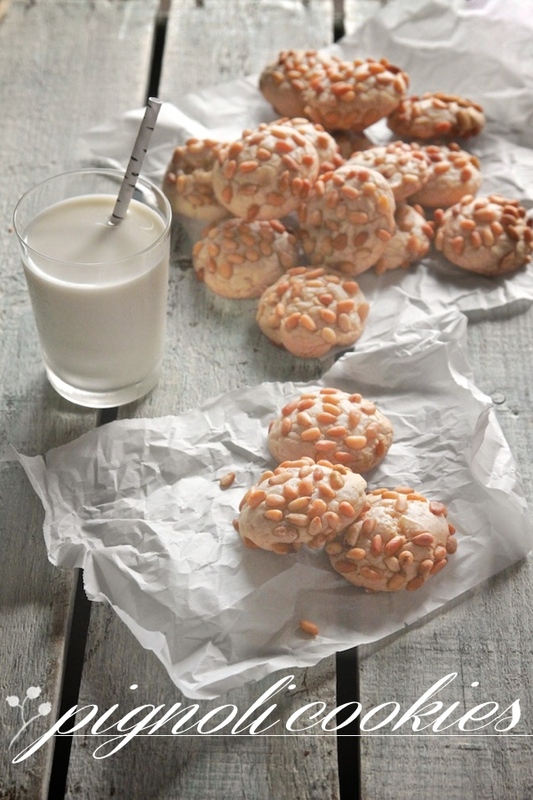 Who doesn’t love almonds? Ingredient gathering is SUPER easy. Salt & pepper not pictured. They showed up fashionably late. 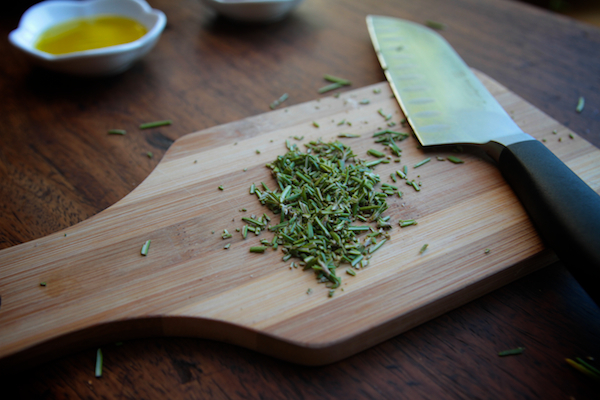 Chop up rosemary! I have a rosemary plant so I can make this WHENEVER I want. That’s only if I have almonds. And I most likely do. They’re my favorite nut. YAY me (said sarcastically). 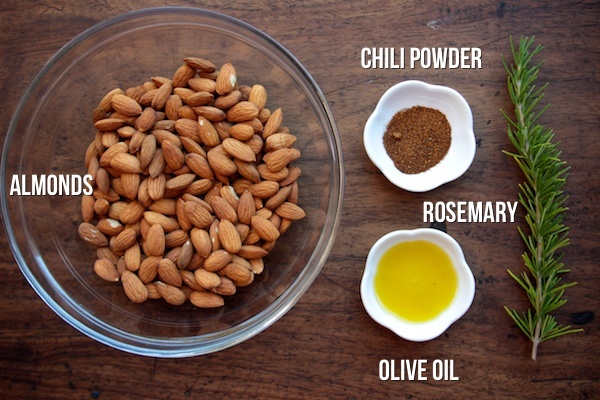 Mix the chili powder, rosemary & salt in a bowl with the almonds. 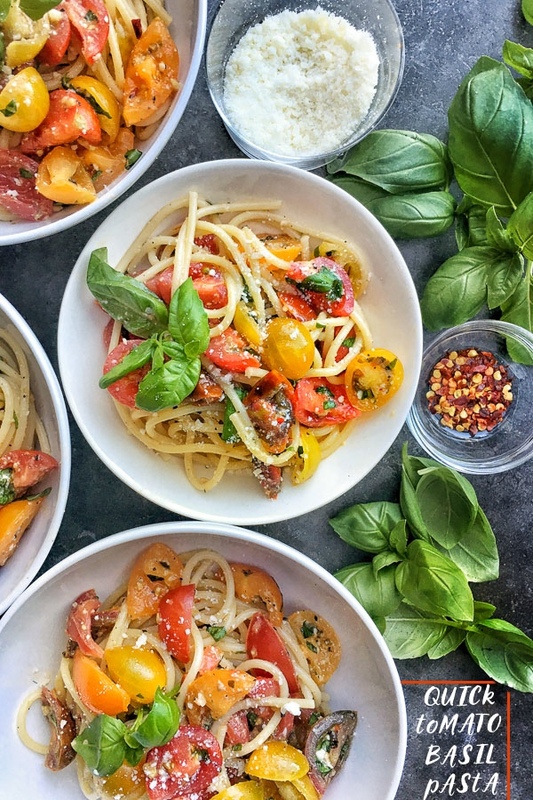 Olive oil to coat it all up. It really enhances the roasty toasty flavor. Well mixed. Sprinkle salt & pepper up on. Mix. Spread out the nuts (ew) on a baking sheet. ROAST. ROASTED. That’s what it says. Can you see the color?! Amazing. 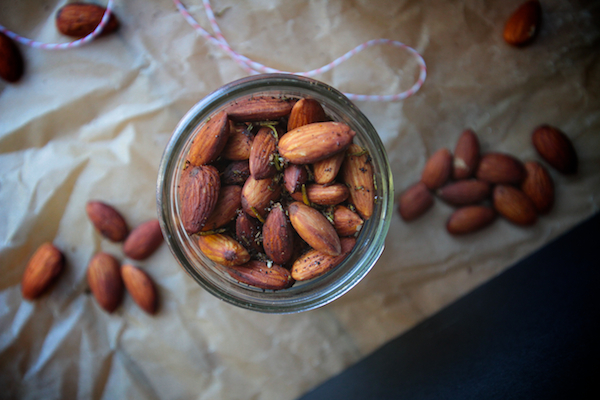 Roasted Rosemary Almonds could be good gifts for the holidays. Yeah…those are coming up. Wait. They’re HERE. 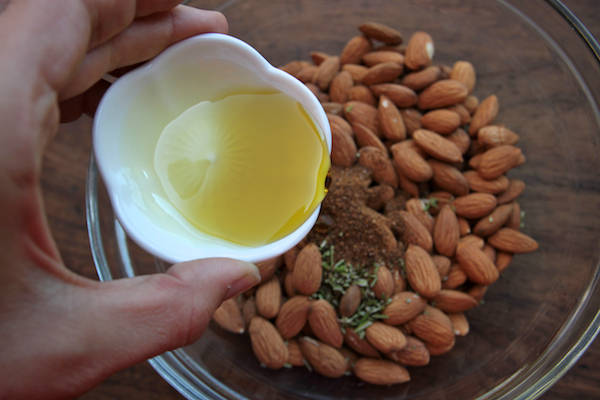 Combine all ingredients in a medium bowl and stir until almonds are evenly coated. 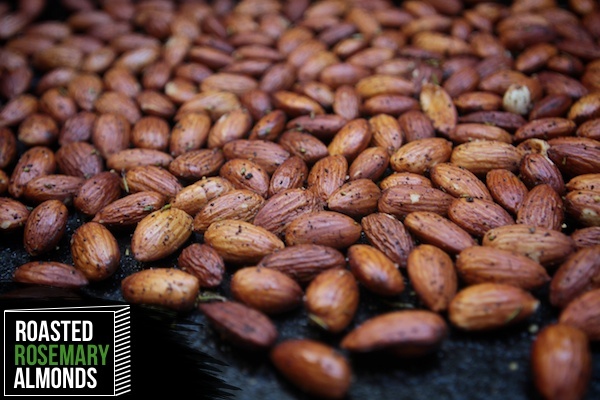 Arrange nut mixture in a single layer on rimmed baking sheet. Bake at 325° for 20 minutes or until lightly toasted. Cool to room temperature. I hosted my entire family for thanksgiving this year (I’m Canadian) for the first time and I went into it with the same mentality: I’ve got this, i love this kinda stuff, i’m gonna kill it. And it was fine! The trick? 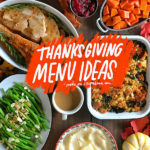 Once I got a bit overwhelmed thinking about the timing/where it was all going to go/how to get it all done at the same time, I just informed my family, seasoned thanksgiving pros, that they were all going to help me. A lot. And it turned out perfect!! I’m making these same almonds this year! Only, I’m using duck fat instead of olive oil for some extra decadence. Hope you have a great holiday! Thank you, I have been trying to come up with how to sneak some more almonds into my diet! And while I love the sugary coated ones, I don’t really feel like they’re as healthy. And these are. So hooray! “Spread out the nuts (ew) on a baking sheet.” Ah hahaha! These look maj delish!! I just roasted nuts for the first time a couple weekends ago for a Friendsgiving… I used the seriouseats recipe below, but subbed the pecans for almonds. 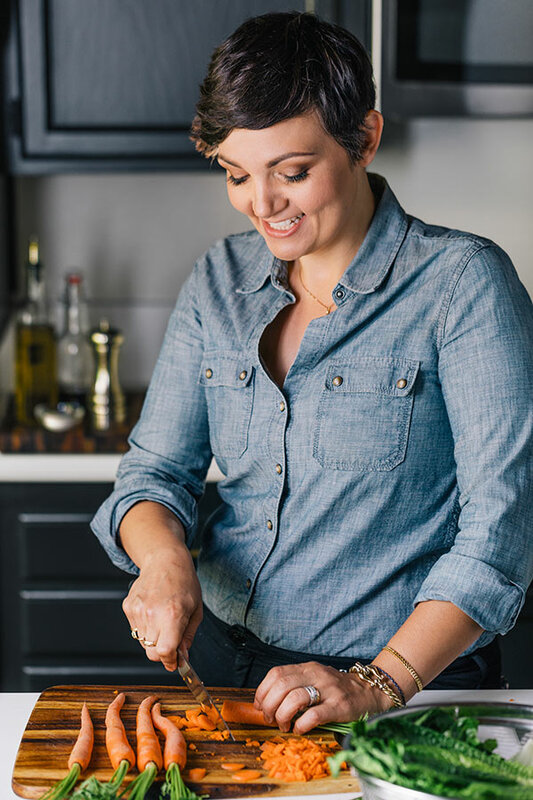 I bet adding a little bourbon to your recipe would be cray amay! 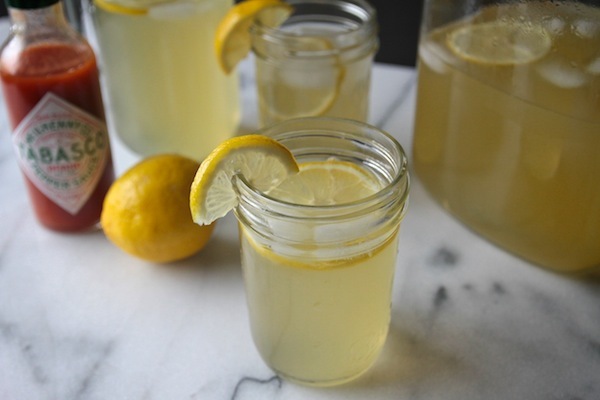 (NOT that your recipe needs any tinkering I’m sure… JUST that I know you’re a fan of a little booze). 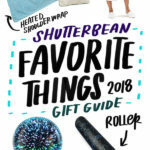 LOVE the idea of giving them as gifts, too! Good luck with hosting!! Happy Thanksgiving, Shuts! 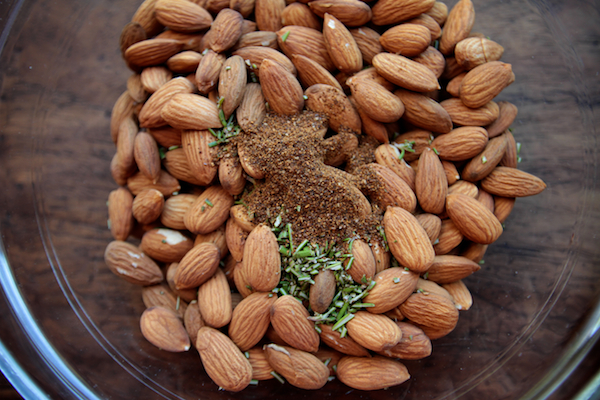 speaking of tj’s and almonds, I have a little bit of an obsession with their marcona almonds with sea salt and rosemary. so yeah. this is definitely going on my list of things to make at home so I don’t keep spending > at tj’s (although their stuff is really pretty reasonable over all). Yeah yeah yeah. I’m totally delegating! these sound great! one clarification…you start with raw almonds, right? I know a few people who would LOVE these. They’re going on the Christmas gifting list. thank you! I am so the same way….I’d rather bake or cook then anything on my to do list. I should probably make these to take with me to Thanksgiving – seems like the perfect thing to contribute since it needs to fit in my carry-on! Does that mean that we would be really really good workers if we were bakers or cookers? Deep thoughts. For real. I made something like these a couple weeks ago! I vegan-ized them for a vegan friend’s baby shower! Basically I toasted them first in the oven, then sauteed (?) them in coconut oil, fresh rosemary, and kosher salt and some brown sugar. So easy for something so good. Are these not vegan? Is chili powder not vegan? Tell me. No they totally are vegan, my bad for implying that! I think the reason I said that is because my original thought for making them was with butter (which I think would be good too…) Ha! Oh yeah, crazy hosting brain. I know it well. It’s the brain that tells me that I MUST clean every single bathroom with a toothbrush before guests arrive. 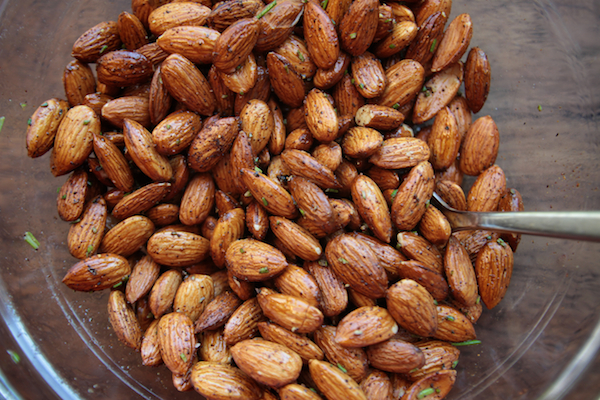 Love these almonds for great snacking food. Why???!!! I mean. My brain says that too, but are people really looking that hard? Nope. 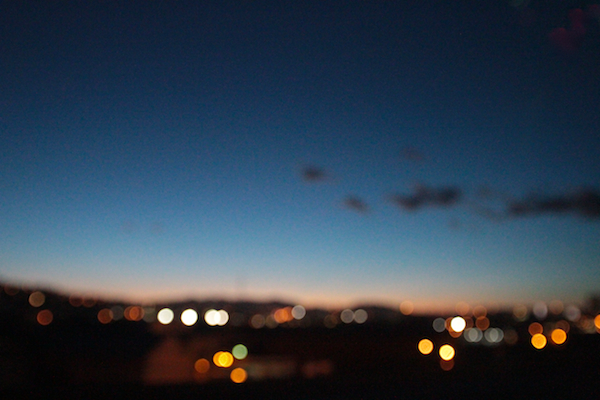 I think it’s just peace of mind. These look so good and there isn’t even that much salt in it! Must try! Yum! Rosemary! These look great, perfect to have around the house as a snack! 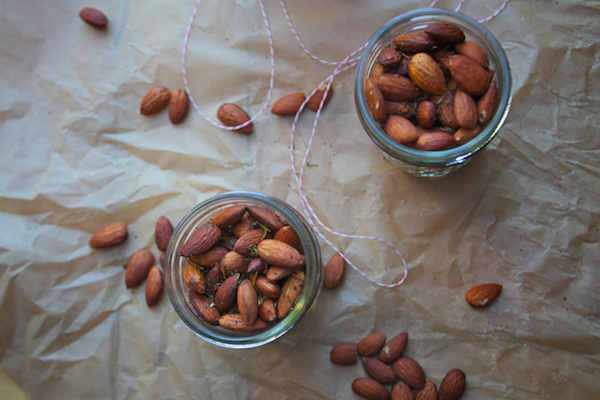 I made rosemary almonds almonds one year ago to the date! My husband begs me to make them again – need to work on that. Yours are beautiful! Well, let’s see if I can make them without burning them !!!! I am prone to burn nuts!!! When I’m hosting and guests call me a week before if I need any help I really have to hold myself from asking to come on the day and pick up my children’s toys, and help me tidying up the house instead of asking them to bring food and drink… It would be so awesome if that was not somewhat wrong….. These sound great! I’ve been meaning to make a big batch of spiced nuts to give as little Christmas gifts for years now. 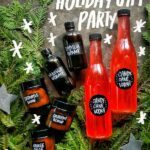 This might be the year – yum! These sound like such a fabulous snack! This year, instead of being assigned to cook anything, our job is to somehow drive from the boyfriend’s mom’s house in Napa, to my family’s place in Marin County, to his dad’s place in Palo Alto. All in the same day. 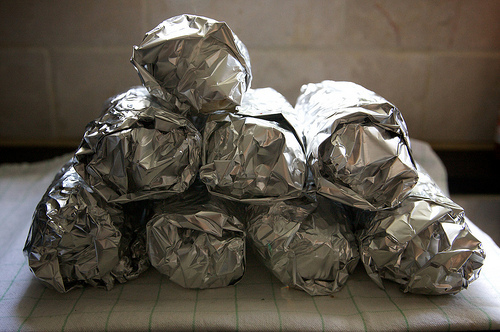 But these may be just simple enough that I could make them tomorrow and have *something* to bring to both dinners! whoa!!! that’s ambitious! good luck and happy thanksgiving!! hey! you’ve totally got this. Remember, lots of people host thanksgiving and most of them don’t spend nearly as much time cooking and thinking about food as you do. I worked myself into a mad frenzy the first time I hosted Thanksgiving and then literally 3 hours before people were set to come over I was like, hey, I’m done! nothing to do but babysit this turkey and start on the wine! 1) don’t go crazy with the appetizers… you want people to eat the main meal so that you don’t have 10 lbs of mashed potatoes left in your fridge. These almonds look perfect. 2) go through your list and see what can be made a day ahead: pie crust? perhaps the whole pie? ice cream? mise en place? Then, if you want, you can talk in your Martha Stewart voice as you pull things out and say, “here’s one I made earlier”. Surely I’m not the only person who likes to pretend I’m on a cooking show. 3) go through your list and see what will need to be finished at the last minute… and try to change those menu items so you have a MAX of one thing that needs last-minute fiddling. 4) make an oven schedule. Include what time, how long, what temp every item needs to go in. accept that your friends and family will make fun of this schedule. 4) make someone else (Casey?) set the table. or set it the day before… I can’t because my cat will sit someone’s plate or eat the flowers if I leave it unattended too long. I’d add, family is forgiving. Even if you mess up on an entrée or dried up the turkey, they can laugh with you and the fun continues. Family is great like that. And these nuts are going to be made for my dad who loves any sort of flavoured nuts. In my oven as soon as I find the freshest nuts around. Those in Carrefour are often stale. boo! Thanks for this! This is my MIL’s birthday week, so I always start her day with a treat for breakfast. These look perfect! I’m a mother of two. Food is absolutely a coping mechanism. Well, chocolate mostly. Oh, and coffee. Just made these! The chili powder gave it a nice kick! Awesome for a savory treat for gifts. Love the recipe, Tracy! 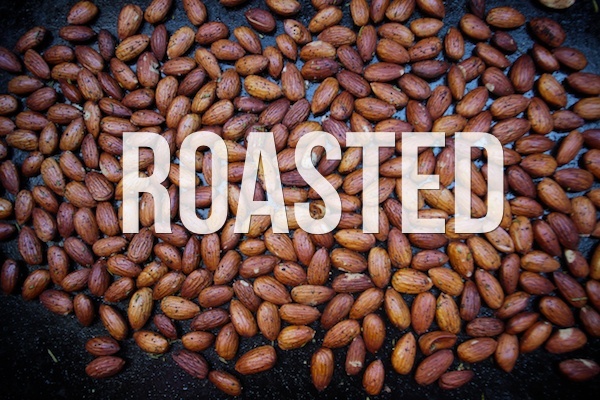 I made mine with pecans and they turned out great – just roasted them for a little less time. Happy holidays! Hi! I really enjoy your blog! I made these almonds not once, not twice, but 3 times in 3 days. So good and such a cute gift. 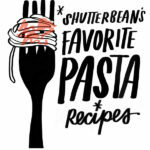 Please check out my blog post about them! Hi, these sounds yummy. 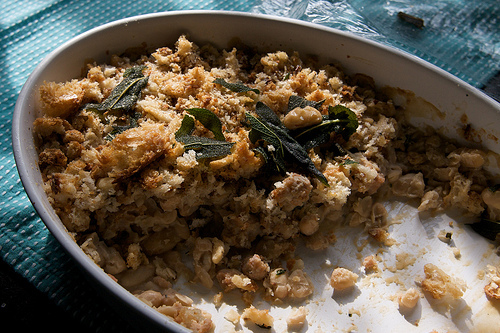 Can you use ground or dried rosemary in place of the fresh?